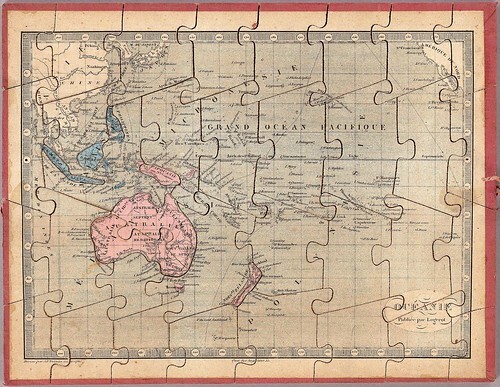 The materials below share the common characteristics of being a jigsaw puzzle or board game incorporating a map, and being produced before 1900. --You cannot teach geography in any way so effectually as by setting the pupil to construct the map from the dissected parts. --Exceedingly valuable in imparting novelty and interest to a useful study. --An agreeable contrivance for blending amusement with instruction. --In putting these maps together, which children delight to do, they will learn "geography without a master," and keep quiet as a mice. 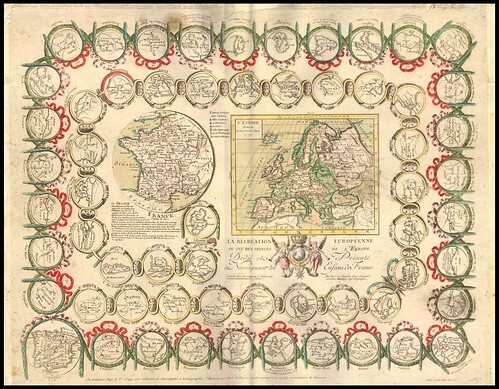 --Every family should possess this series of maps that the younger members may profitably while away their leisure hours. Nothing can be more useful. 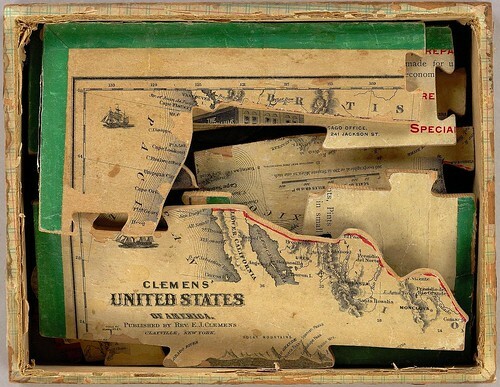 --An ingenious device for teaching geography. --Physic and geography were equally distasteful in our youthful days, but sugar coated pills have induced children to cry for the first, and we venture to assert that the ingenious originators of this idea, have rendered the second attractive. 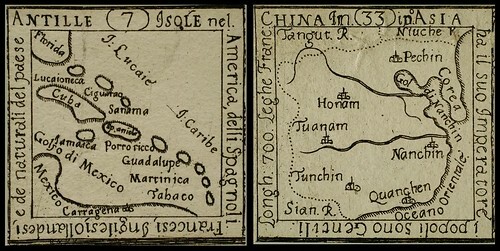 These maps of the Caribbean Antilles and China are details from a map game conceived by the Benedictine priest, Don Casimir Freschot and published by Giovanni Pare in Venice in about 1680. This game is believed to be the first or one of the first known games in the English-speaking world to be attributed to an individual designer. 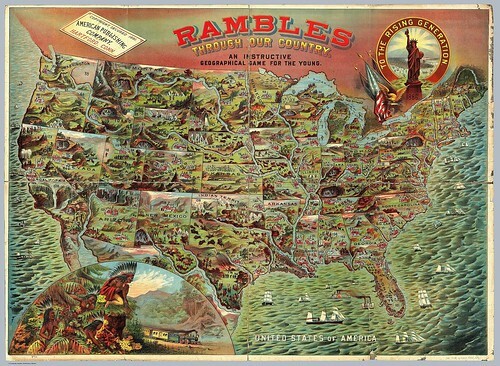 It was first published by Carrington Bowles, a British publisher of hand-tinted, cloth-backed maps. 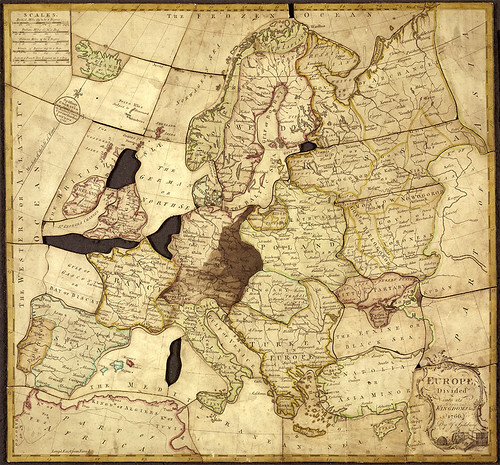 This game reconfigured a map of Europe to provide a game rather than a reference. It's a straightforward track game. The game uses a teetotum - a spinning top with numbered sides - as dice were viewed as gambling instruments that would not be permitted in respectable households. The players begin and end in London, and many spaces advance players or transport them to other portions of the board. 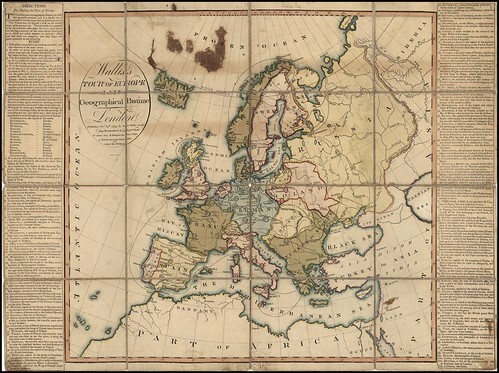 For example, a playing piece that lands on Hanover "shall by order of Ye King of Great Britain who is Elector, be conducted to ... Gibraltar to visit his countrymen who keep garrison there" while the playing piece that lands on "Rome for kissing ye Pope's Toe shall be banished for his folly to ...the cold island of Iceland and miss three turns". 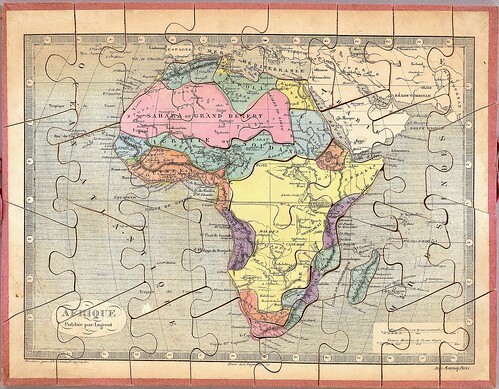 This map is a jigsaw puzzle. It was designed by John Spilsbury in 1766. 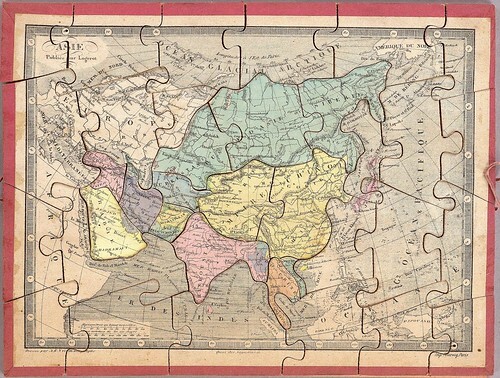 Spilsbury, formerly the apprentice to the Royal Geographer, is believed to have been the first commercial manufacturer of jigsaws. He managed to start quite a trend. 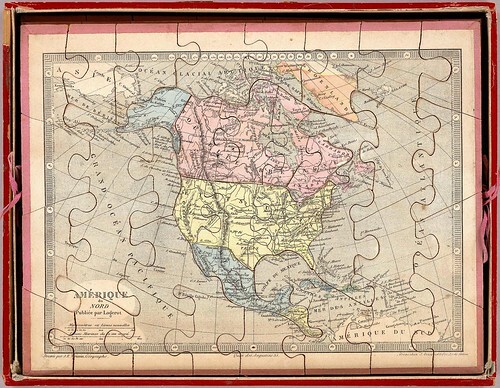 For a good 20 years during the mid 1700s, all manufactured jigsaws were in the form of dissected maps like Spilsbury's. 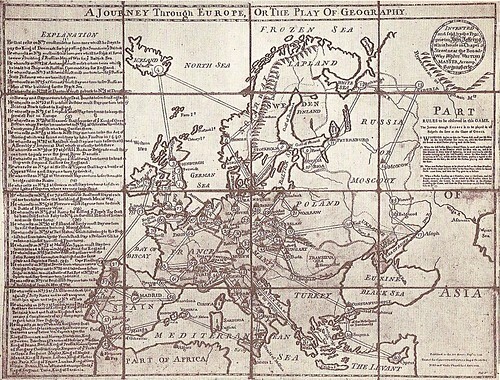 The maps were designed as teaching aids for geography classes. 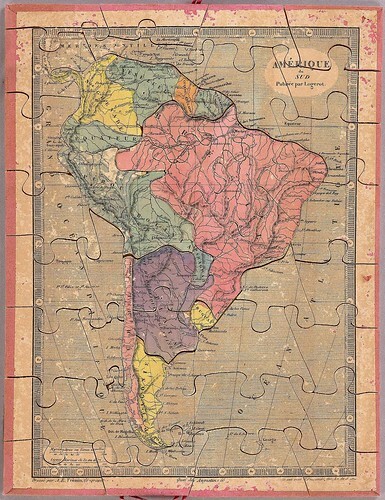 As pupils put the pieces together, they would learn how different countries connected to one another. John Spilsbury certainly spotted a business opportunity. 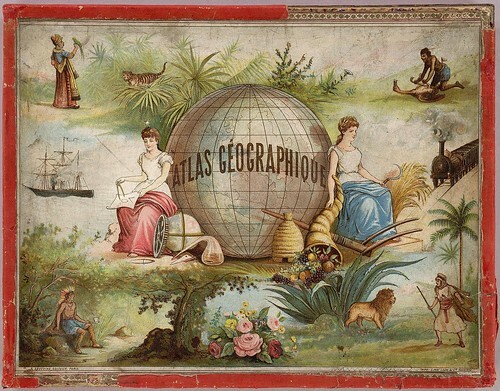 In the space of two years he marketed the eight map subjects most likely to appeal to upper class English parents: the world, the four continents then known (Africa, America, Asia and Europe), England and Wales, Ireland and Scotland. 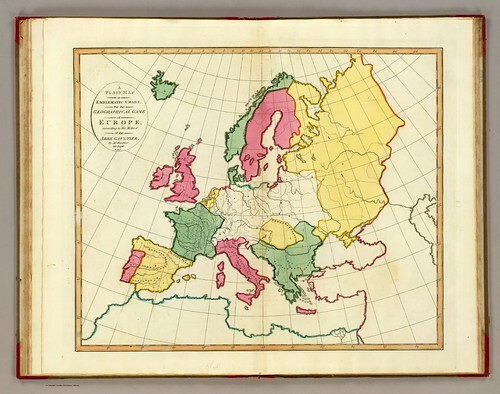 First Edition of this famous map-game, which was reprinted in 1802 & 1811 (and probably at other times). 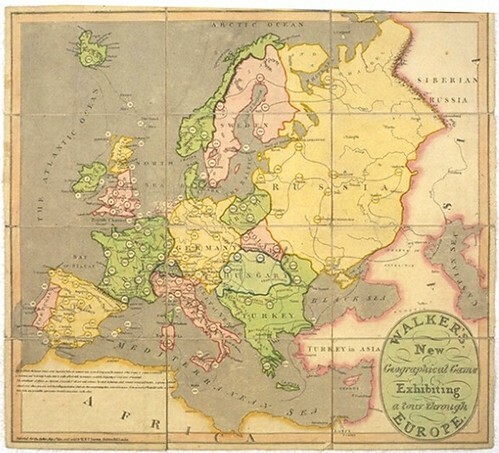 A rare specimen of the craze for educational games that swept Europe and Great Britain in the late 18th and early 19th centuries, this highly attractive map is the game board for an edifying tour of the leading cities of the Continent and the British Isles. 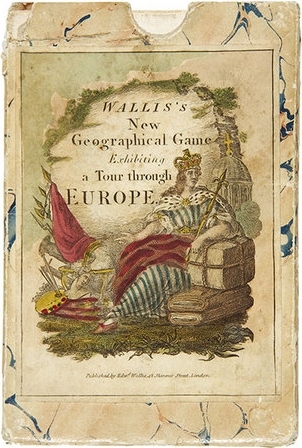 UPDATE (Jan, 2010): Walker's Tour Through England and Wales, a New Pastime, London, 1809 at MDZ. 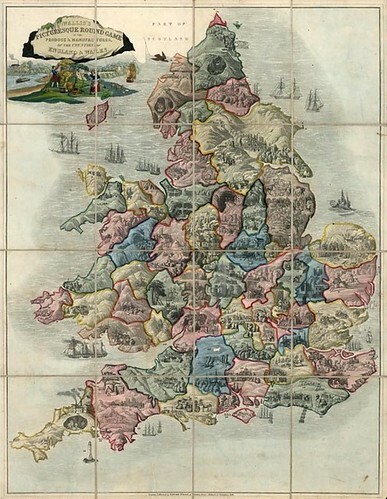 Educational map game of England and Wales, designed to teach notable aspects of each county. 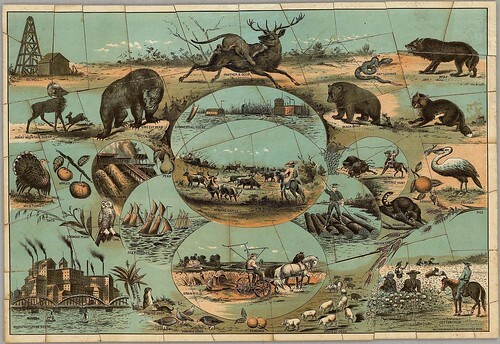 Produce and manufacturers are illustrated in pictorial style and numbered on variously colored counties, together with famous sites and popular pastimes. 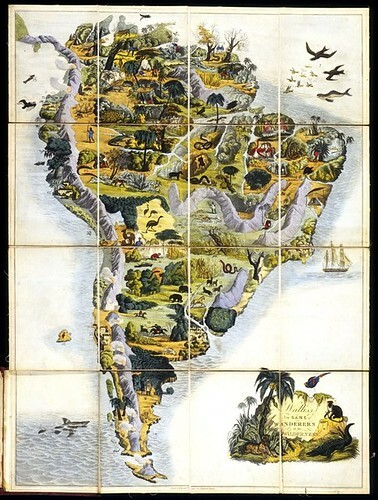 The map also includes topographical features such as mountains, bodies of water and forests. Ships dot the seas. The cartouche, in the form of a castle wall in ruins, is surrounded by scenes of a farmer and wife, railroad, ships, etc. 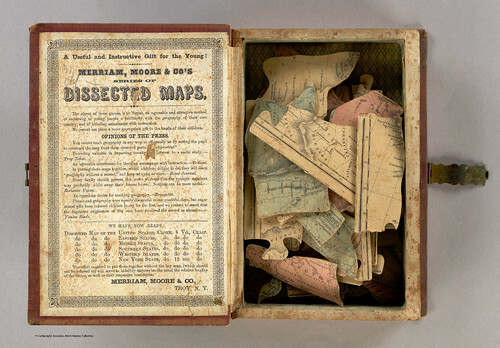 The game takes the form of a “dissected” (sectioned folding) map, that opens into a race game that starts at the mouth of the Thames and travels along 151 stops to the destination of London. For example number 10, Ely, was known for eels and strawberries, and number 126, Dorchester, was known for butter and strong beer. 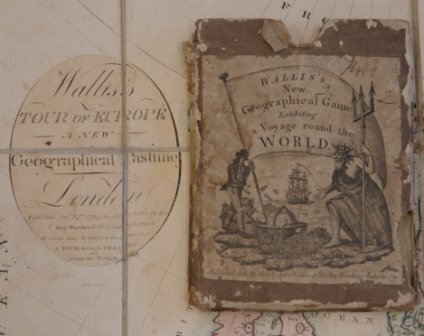 Originally published by Edward Wallis between 1826 and 1837, Wallis’s publication line appears on the map. The name of John Passmore, who took over Wallis’s stock in 1847, appears on the instruction booklet. 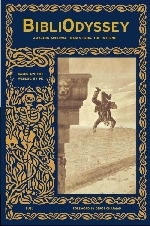 The Bodleian Library at Oxford University in England has both the Wallis and Passmore editions of this game in their collection, and both the British Library and the University of Wales have the 1844 edition. 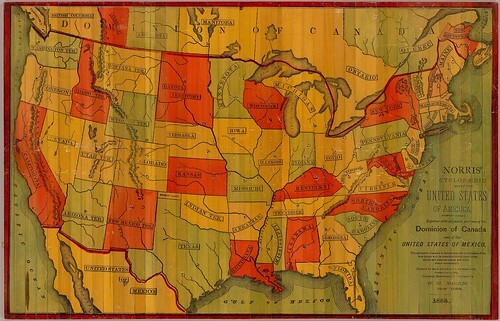 The game was innovative with respect to its cartographic style combining correct county boundaries and non-traditional pictorial design. Despite this print appearing in quite a few repositories, I haven't been able to find a large version. However, I spliced together a partially complete high(ish) resolution image from the Aberystwyth site that can be seen here. according to the method of the Abbe Gaultier. By Mr. Wauthier, his pupil, 1797. Hand-coloured etching made by Maurille Antoine Moithey; published in Paris in 1770 by Jean Baptiste Crépy. 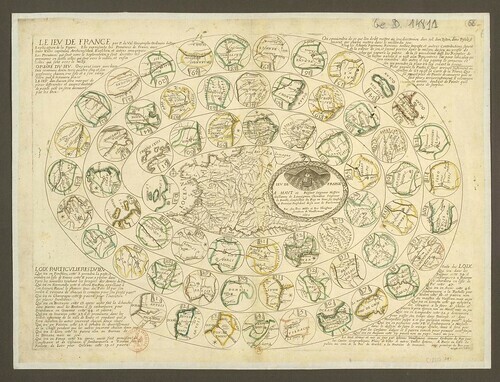 Game board with 61 circular numbered compartments arranged in a spiral, each containing a map of a state, with the state named beneath, the first being Spain and the last being France; in the centre the large final compartment containing a map of France, a map of Europe, beneath which, the royal coat of arms. Hand-coloured anonymous etching published in Paris between 1740-1768. 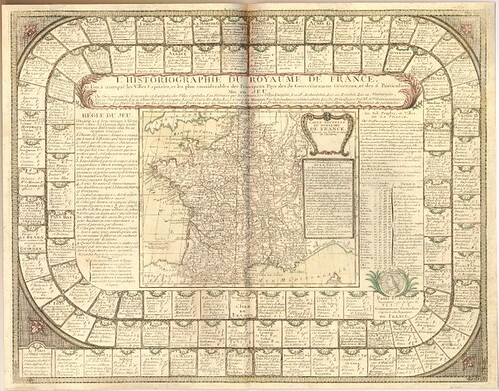 Game board with numbered compartments from 1 to 108 arranged in a spiral, the more elaborate compartments bearing a cartouche with the name of a region in France, beneath which are listed its principal industries, the subsequent compartments containing lists of its principal cities and towns, with a key to their status, the final compartment being Paris, surmounted by a portrait medaillion of Louis XV. Published at Chez Basset in Paris in 1795. J.N. 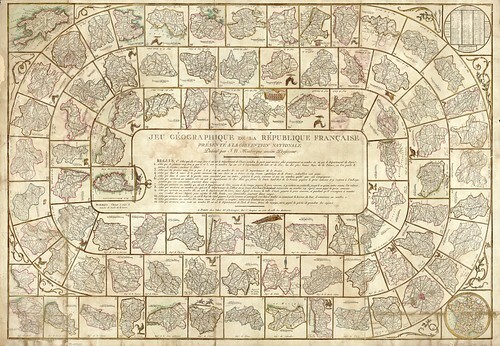 Mauborgne, a former professor of geography in Paris, created this “geographical game of the French Republic”in honor of the government of the National Convention during the French Revolution. 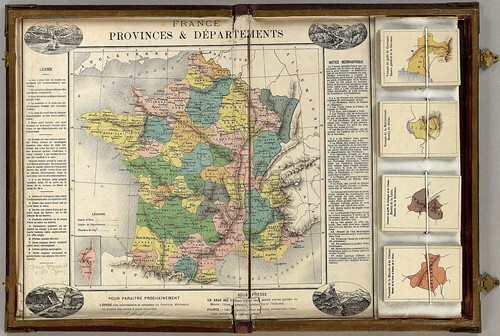 Mauborgne’s game involvestraveling around republican France, which was divided into 83 'departments', the new unit of territorial administration that the Revolution introduced to replace the much larger historical provinces. Published by Etienne Vouillemont in Paris in 1659. Pierre Duval was a nephew of the great French geographer Nicolas Sanson who rose to become 'geographer to the king' in his own right. 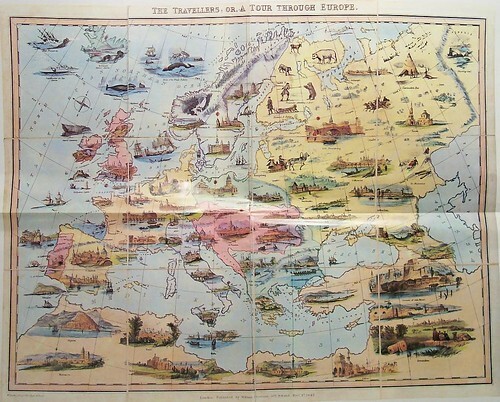 In the 1660s and 1670s he published a large number of atlases and geographic works. Duval was the first in France to conceive of geographical games that aimed to inform and instruct while providing entertainment. 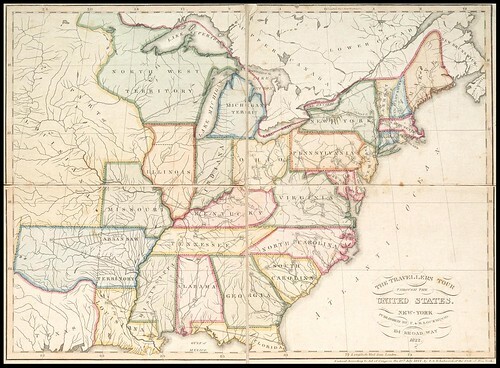 The board is a map of the United States c. 1822, the westernmost states being Missouri and Louisiana. Because dice were frowned upon as instruments of the horrible vice of gambling, included a teetotum, a sort of spinner used to randomly yield a number from 1 to 8. This is used to determine the first player. Lines are drawn on the map to connect cities in a continuous path which players must follow. However, the cities are not named, but numbered. 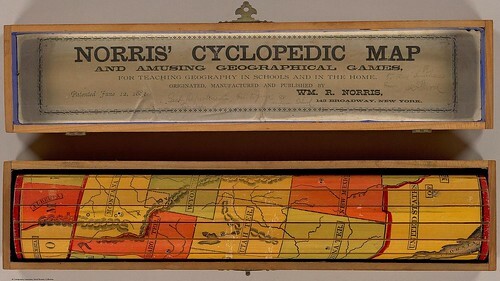 Published by Milton Bradley in Springfield, Massachusetts in 1880. For non-Americans: note the single Dakota (the 2 states were admitted into the Union in 1889) and 'Indian Territories' for Oklahoma (1907) (I think it's seen in most/all the USA maps here). 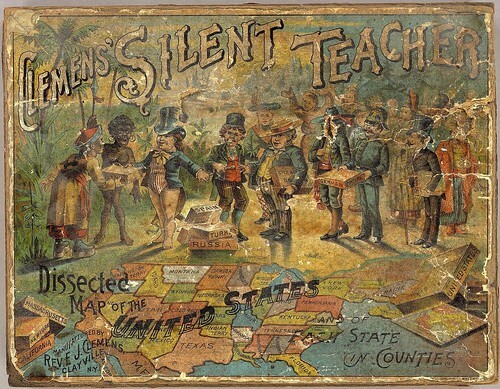 Clemens' Silent Teacher. 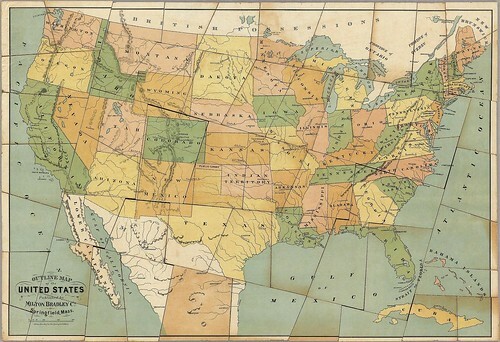 Dissected Map of the United States and of Each State in Counties. Manufactured in 1893 by Rev. E.J. 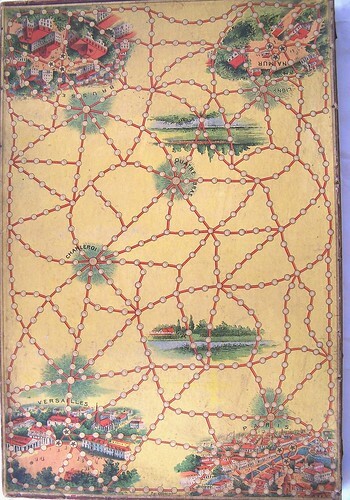 Clemens, Clayville, N.Y.
Afrique; Asie; Europe et ses Chemins de fer; France et ses Chemins de fer. Nellie Bly was the pseudonym for an extraordinary and innovative reporter named Elizabeth Jane Cochrane who worked for the New York World newspaper. 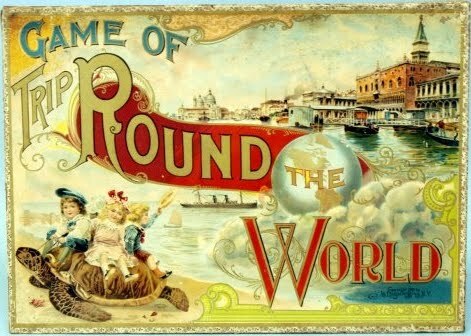 After Jules Verne's 'Around the World in Eighty Days' became popular, Cochrane attempted her own world tour (completed in 72 days) and wrote a series of dispatches during the journey around which her employer built a hugely successful article series. 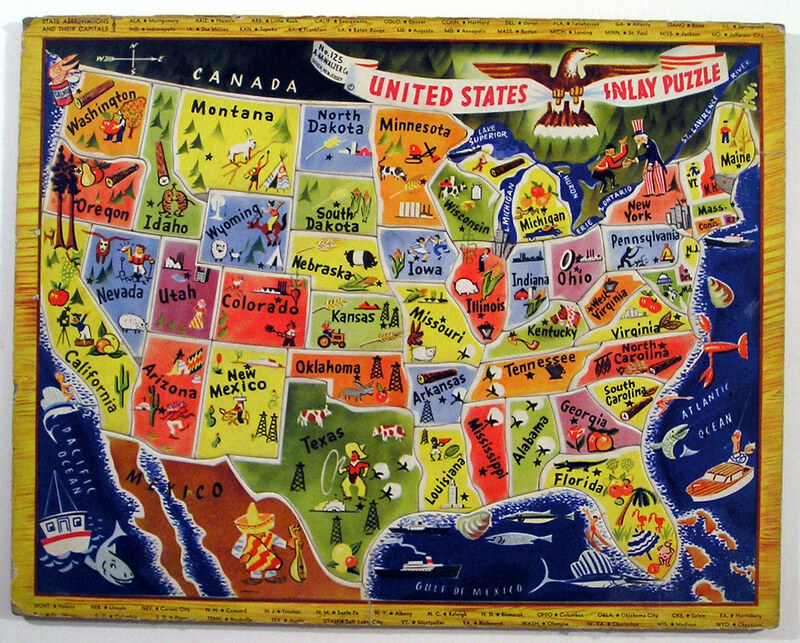 Game maps were included with the stories so that the public could follow along at home. 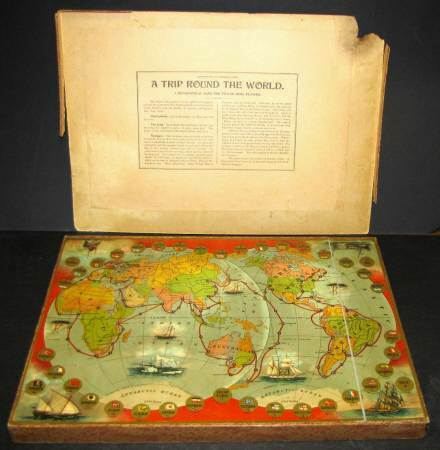 The episode gave rise to many world tour map games featuring Bly on the box cover (published up until the 1920s) and inspired entrepreneurs to bring out more variations on the geography game theme for an enthralled American audience. The majority of commentary above is either quoted or paraphrased from the source sites. The array of images presented is neither exhaustive nor meant to be a serious review/sampling. Basically I'm giving up now without really discovering any of the Dutch, German and (no doubt) other versions of these fascinating items of historical ephemera. There is definitely a lot more material online but, as a few of the pictures above demonstrate, the image quality is not always optimal. Thanks very much to Jamie from the excellent Cartophilia site [mouseover the link] for providing some link assistance! Hordern / Games et al. Previously: Board Games and in general, cartography. Thamks so much for all the time you put into this...you ARE amazing and appreciated! These are amazing, you obviously put a lot of work into this post. This is a wonderful post and finding! have you under your hands some of these map games? Cheers! Nice site Steven and thanks for dropping by Moon! Great post. Hope you don't mind, here's a couple links to some more recent map puzzles in my collection: here and here. Thanks. At least one of those is from the 1960s (probably both) -- I basically avoided the 20th cent. 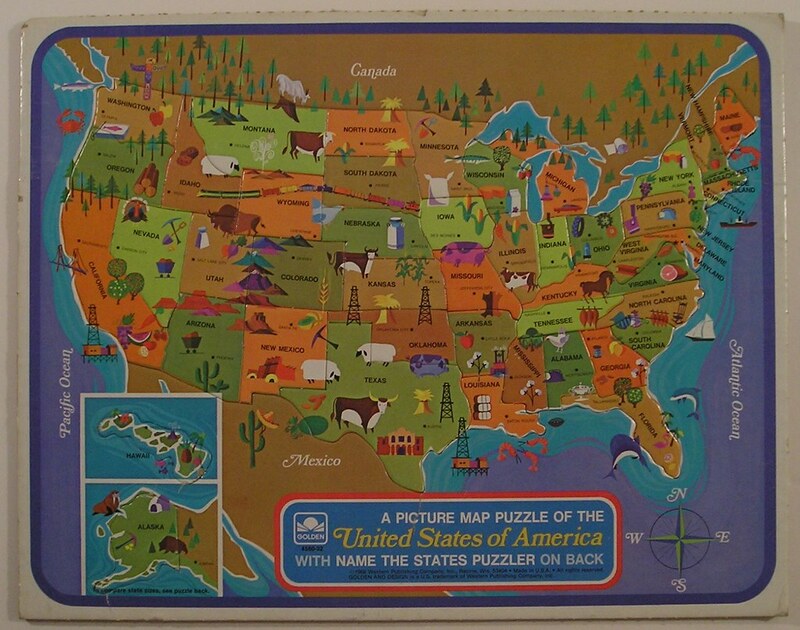 because there are just SOOOOO many board game and jigsaw puzzle maps.